Hello all! I've gotten so many questions about the planked walls in our loft lately, I decided to give you a step-by-step process on how to do it. 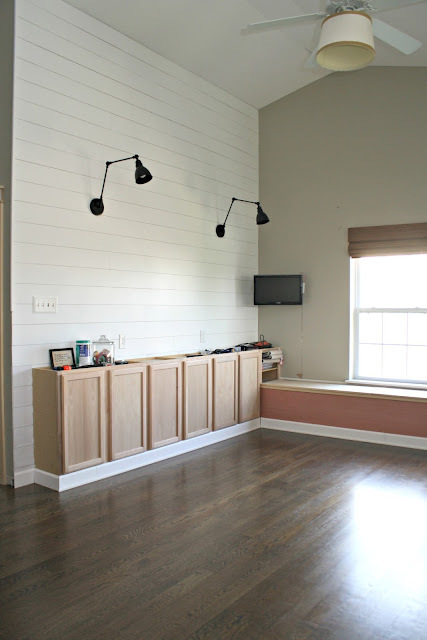 If you love the shiplap look on Fixer Upper than this is the tutorial for you! This is the same look but waaaaay less. 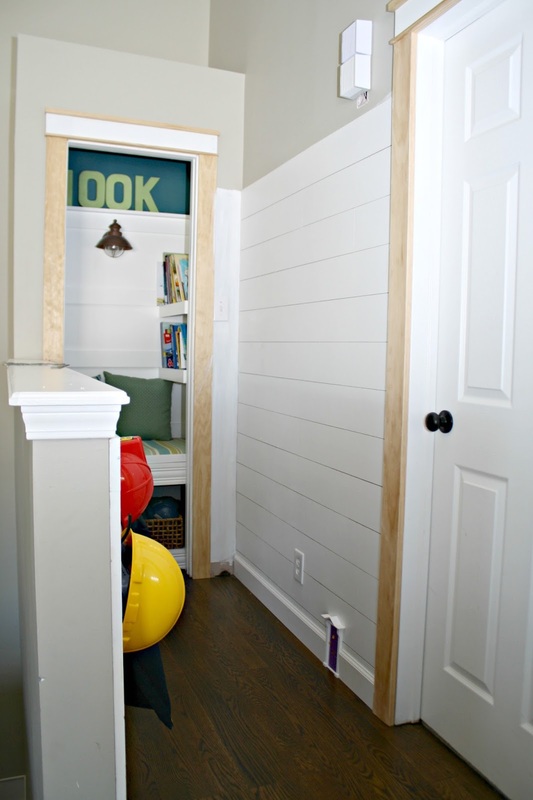 It cracks me up that this look is called shiplap now -- yes, I know, that has been around forever but many of us called it planked walls for years. I've done it numerous places around our home and I'll link to those at the end of the post. I've done it a few different ways and this one by far the cheapest and most customizable. 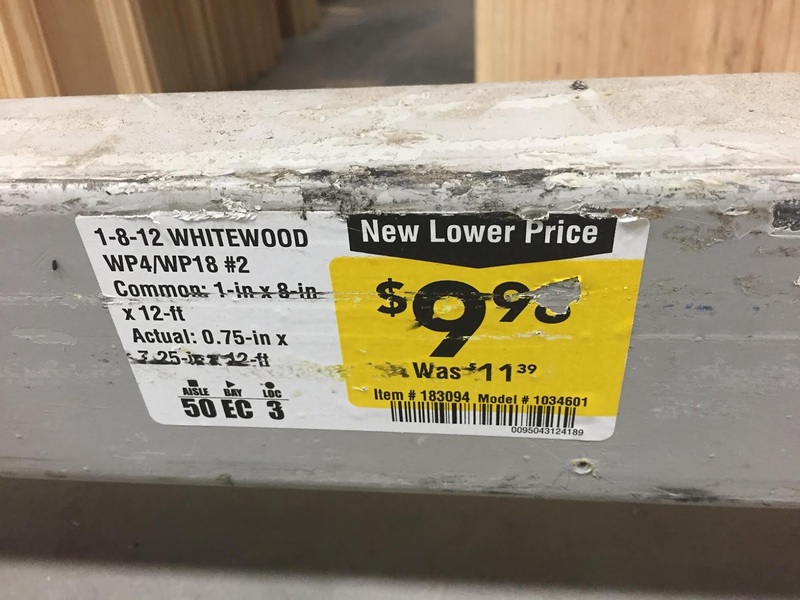 This is 12 feet so in terms of trim or wood, that price isn't too bad. But that wall above would have at least $150 (it's wider than what I used so not sure exactly how many I'd need) and it only cost me about $65 to do that huge wall. I love that it is very thin and lightweight -- really easy to work with. I also love the look of it. 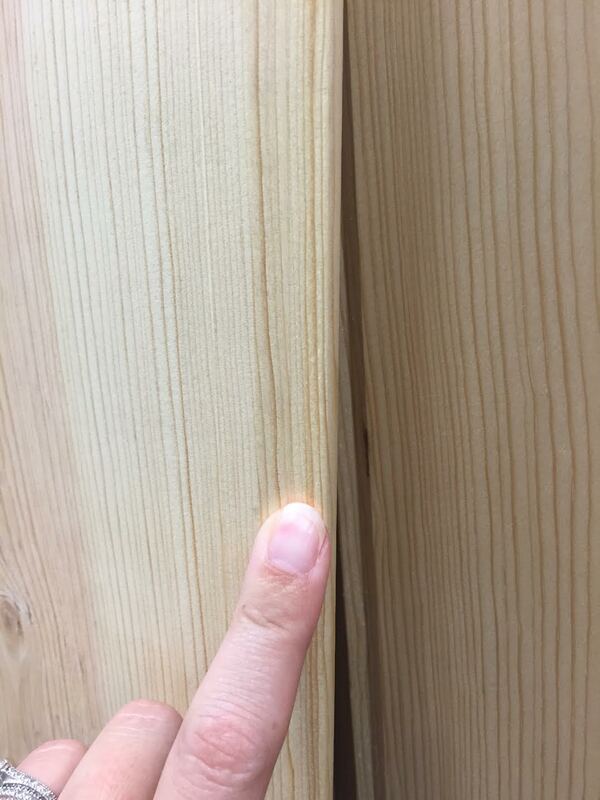 When painted if you look close it has a slight wood grain. I understand that this probably takes up a ton of their time so I'm totally on board for charging, but the increase surprised me. And the scheduling part too. I had just seen this sign so was nervous they wouldn't help me but they did and didn't charge. I find if you go during the day at a slow time (late morning or mid-afternoon during the week) then they are happy to help. 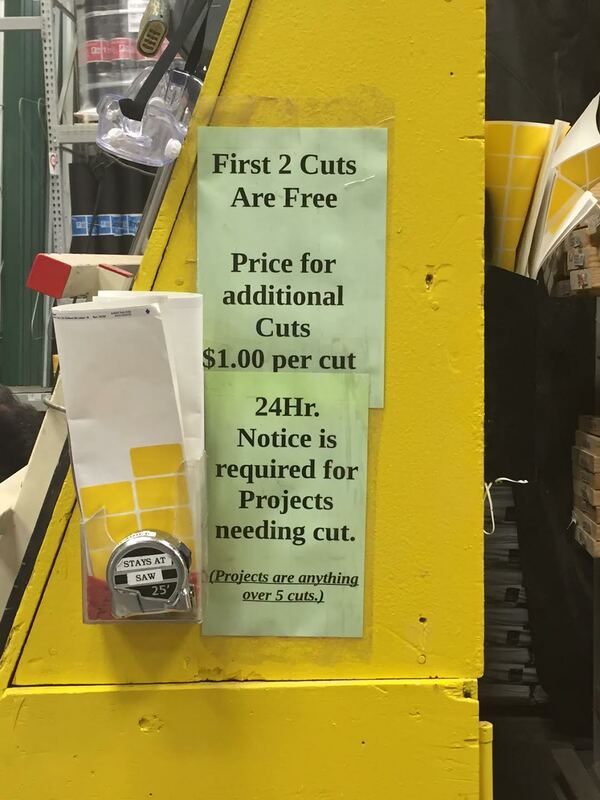 I'm not sure if Home Depot is charging as well? Anyway, keep that in mind if you don't have a saw or someone who can help you! You can use anything, this helps to keep it consistent. Here's another tip -- if you have a long expanse to cover I suggest you cut some pieces at the length of the studs. I marked on the wall where they were (for nailing them in anyway), but this also gave me measurements for some of my boards. 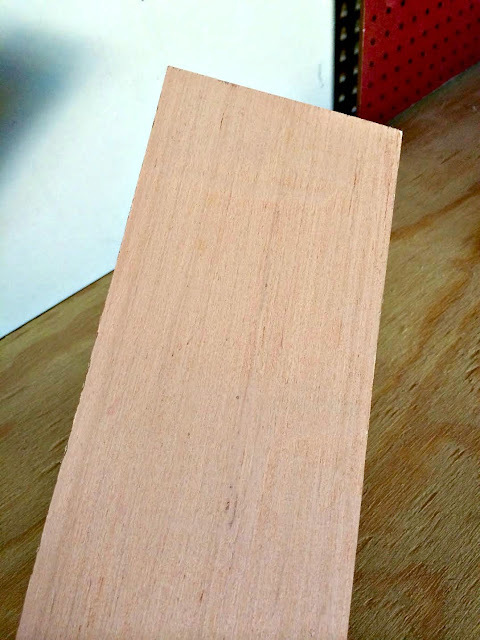 Cutting your wood will make it go further. If you cut each piece the length of the wall that is great, but you will have a TON of scrap that will go unused. I find cutting them makes it so I can use almost every bit of the luan. And you cut at the studs so that the end of each piece is secure when you nail it in. If the end of your cut is not at a stud then the wood may not always hold flat against the wall. Again, this stuff is pretty thin so that's not a huge problem. I will add a couple of smaller trim pieces up on top to finish off the wall as well. If there is anything I didn't cover that you have questions about please let me know! Overall this is a simple DIY project, it just takes time. You will need at least a handsaw to cut the boards as you install and I use a nail gun to put them up. As I've said before, I would not use glue unless you are positive you will never take them down. You'll be left with a mess if you do! 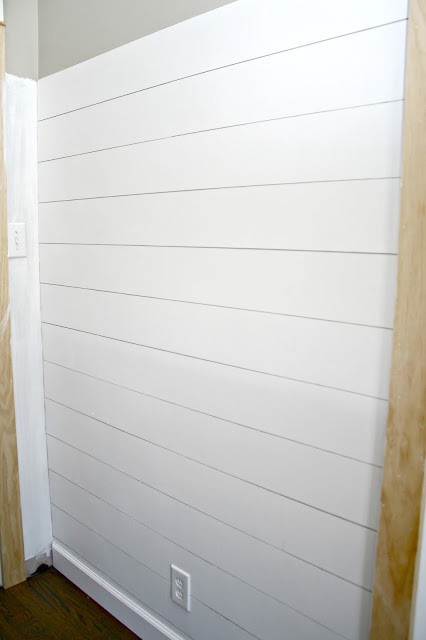 Here are some other shiplap/planked wall projects I've completed over the years! Have you added this look to your home? Feel free to add links in the comments if you have. I will be back next week, as I'm heading off to the Haven Conference for our fifth year! Can't believe it! Invaluable info - thanks so much! I am doing this in my son's room very soon so really appreciate all the details. Your space is looking so great! :). Sending a link of this to my dad now - aka my 'plank cutter'. Ha! Thanks for the tutorial! I'm wondering if you have any problems with paint filling in your spacing gaps. Worried about that! 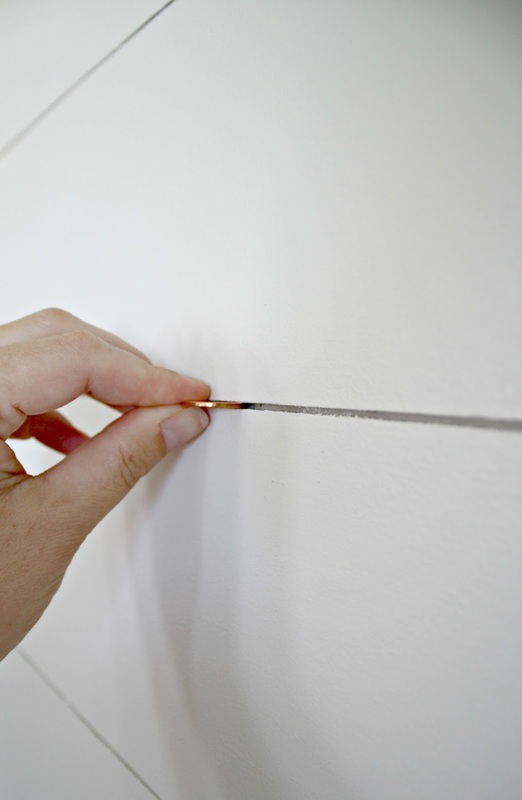 What size nails did you use to get through the luan and drywall and into the studs far enough to be secure? Trying to convince my skeptical husband this can be done without glue. Thanks! Love! 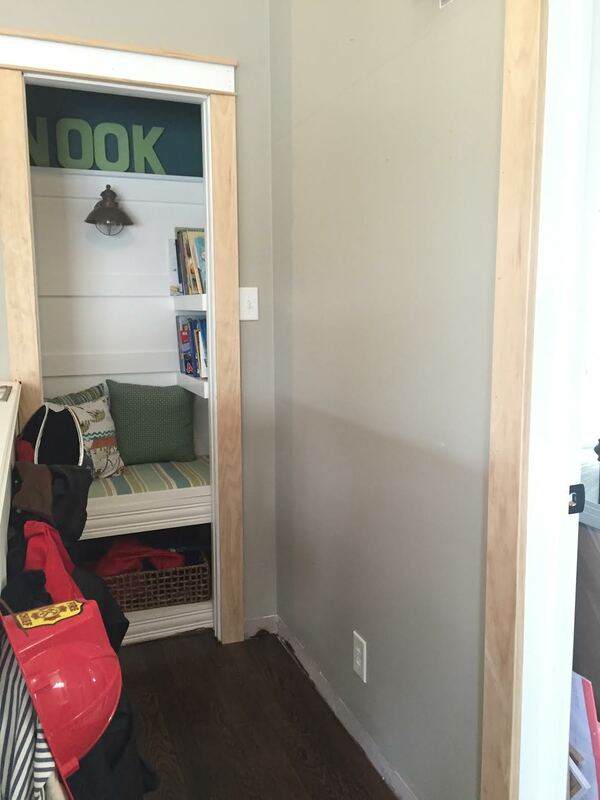 I'm eyeing our garage hallway for some planked walls - it's a dark space so hoping to lighten it up! 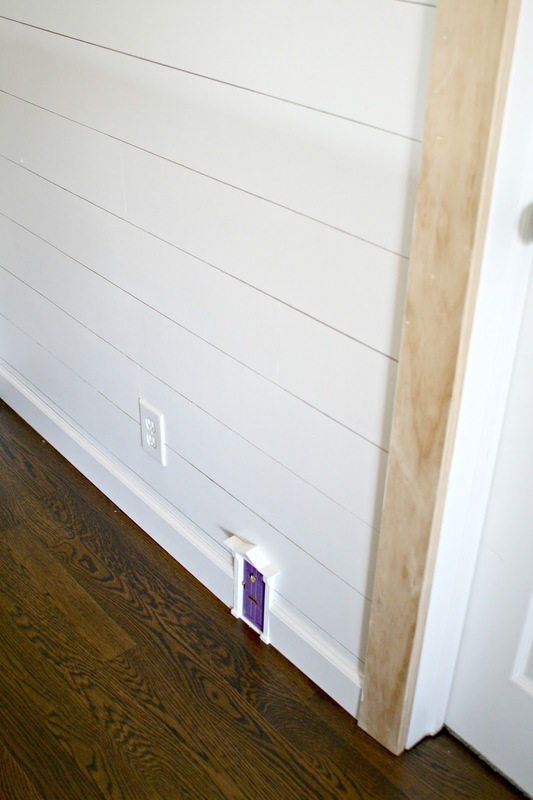 I am laughing about how everyone calls it shiplap now instead of planks too! I still call it planked walls! 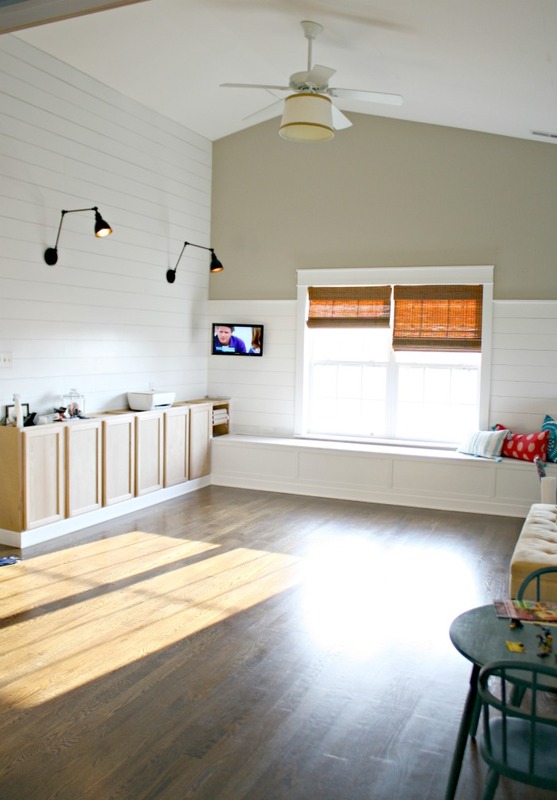 I love how your loft turned out! 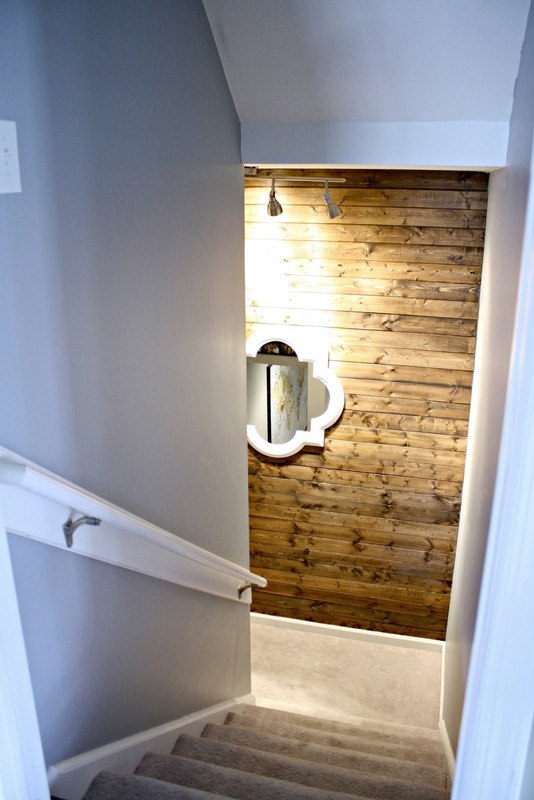 Your loft looks so incredible, love plank walls. As I type my comment am printing out project. Would so love to put those up in our mudroom, would be good room to practice in as would only do 3 small walls, break up just having painted walls. If I have to buy luan little at a time for our budget. Love idea of doing that in our mudroom. Also wouldn't that be a kind of insulation for a room? Mudroom gets really cold in winter, our back door is in this room. Think nailing boards is much better idea than gluing as you said. Thank you so much for this! I love this look and really want to do a wall in our bedroom, similiar to the one in your basement kitchenette. 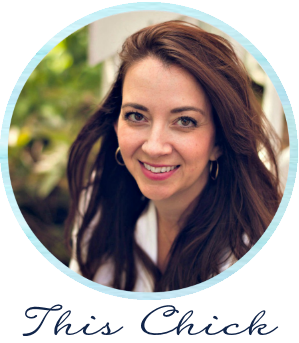 Just found you...I think through Pinterest...really love your posts and blog! Have a good day. Oh my goodness Sarah. You have just saved my sanity. 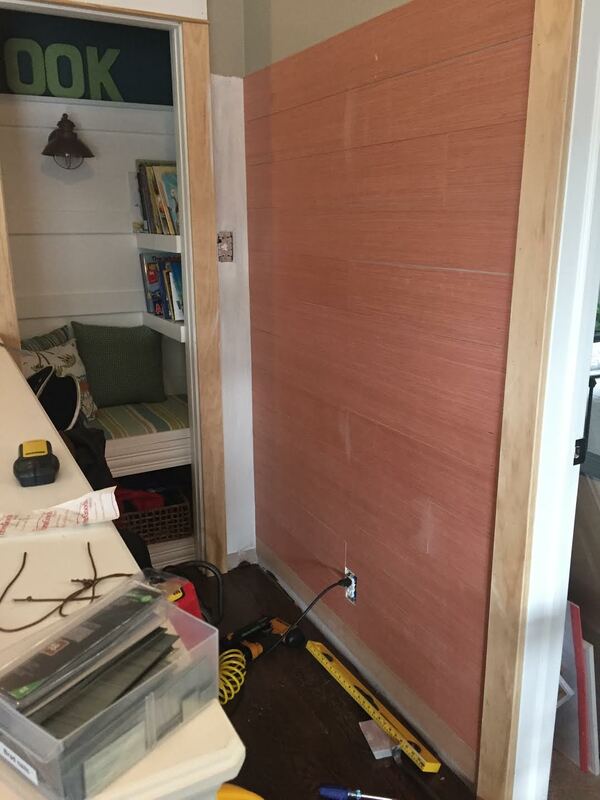 I am wanting to do a "shiplap" wall in my dining room but didn't want to use thicker boards. Why didn't I think of luan?! That will be perfect. 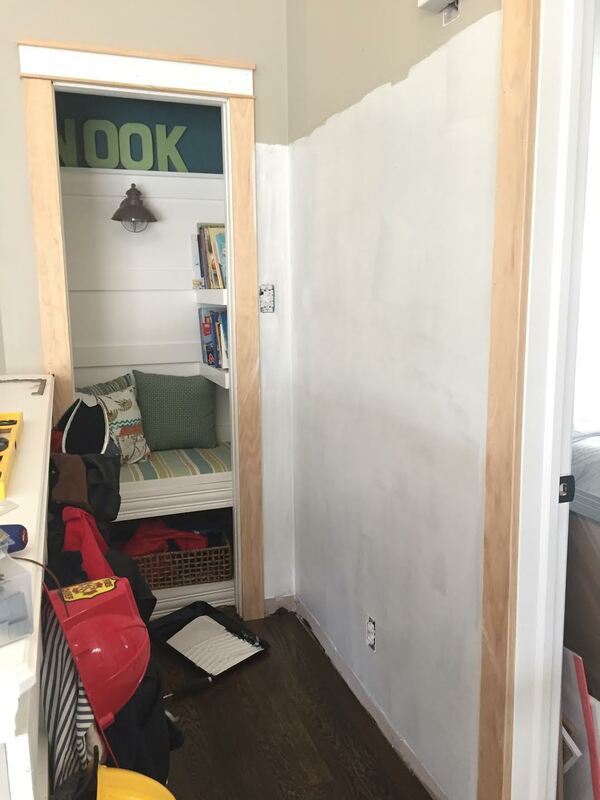 I love all the projects you've done with the shiplap! Oh and I love the fairy door, such a cute idea. 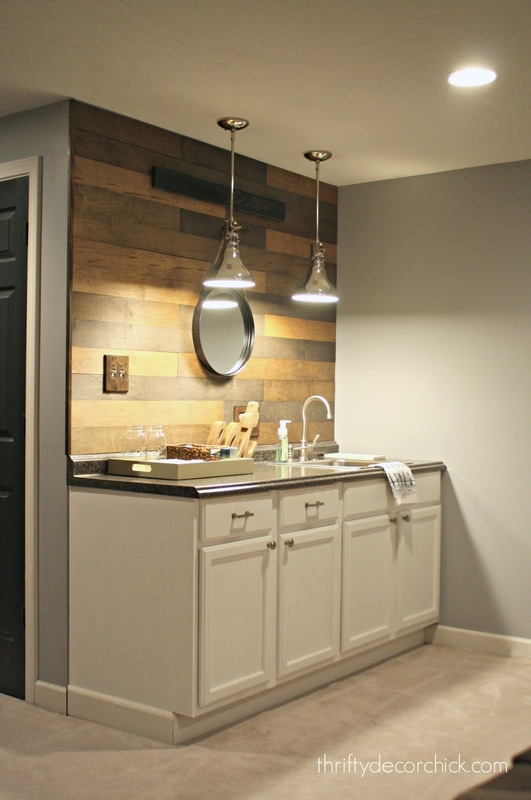 What stain did you use for the gray on your basement wall? Question for you- where does the first board go? If you are doing the entire wall, do you start at the bottom and work up and then use a molding around the edges to hide the shorter plank at the top or visa versa and at the bottom? 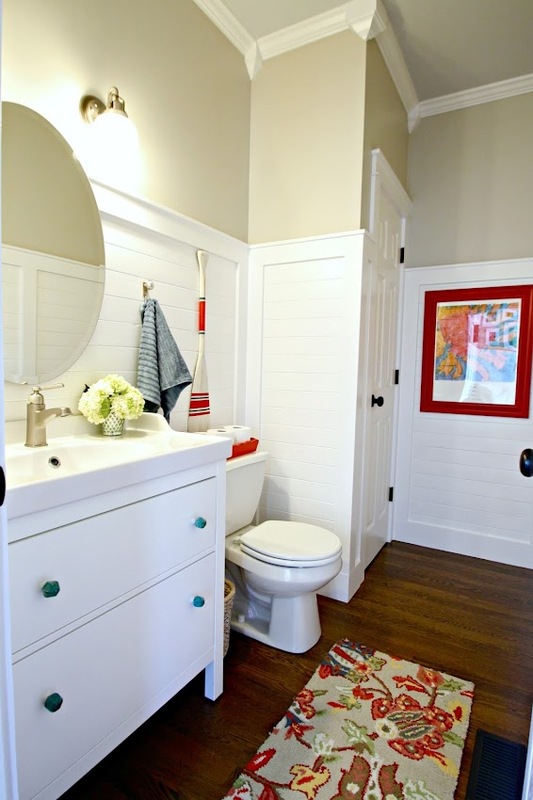 Shiplap walls create texture in such a clean and unfussy way. 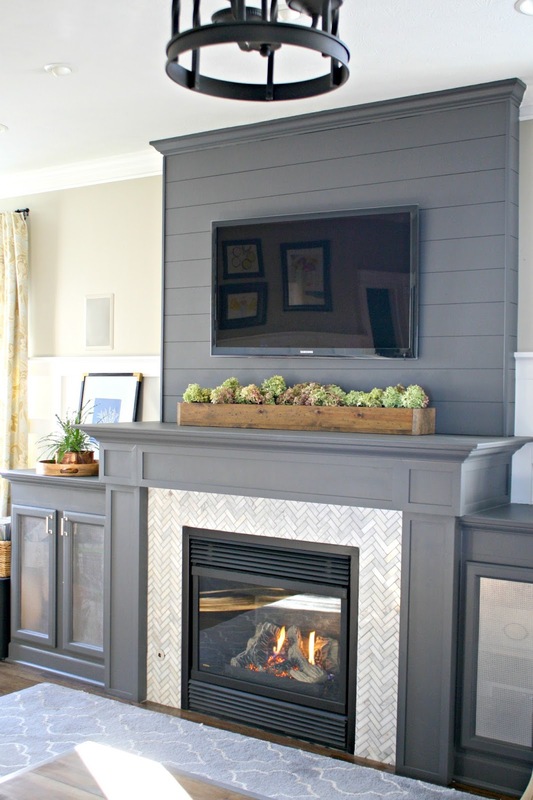 Actually I love shiplap because it is handcrafted and it can add warmth to what can be a more austere modern setting. Also the lighting of it should be more creative as it is.